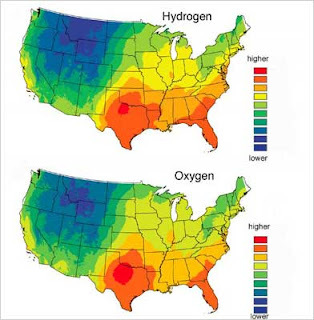 Hydrogen and oxygen isotopes from local drinking water leave signatures in human hair that can help identify where someone has lived in recent years. The study was based on hair from barbershops in 65 cities in 18 states. Such information could provide clues about the origin of unidentified human remains. But, based on the maps, it doesn't look there's a way to differentiate residents of Phoenix from those in Tucson, or for that matter from snowbirds from the upper Midwest. A coming crisis in water supply for the western U.S.? A new study in the journal Science shows "that up to 60% of the climate-related trends of river flow, winter air temperature, and snow pack between 1950 and 1999 are human-induced. They portend, in conjunction with previous work, a coming crisis in water supply for the western United States." The authors observed that "between 1950 and 1999 there was a shift in the character of mountain precipitation, with more winter precipitation falling as rain instead of snow, earlier snow melt, and associated changes in river flow" in which the river flow is relatively increased in the spring and decreased in the summer. While only a small part of Arizona is among the three basins studied, the Colorado River basin is the source of much of the runoff supplying the Colorado River. 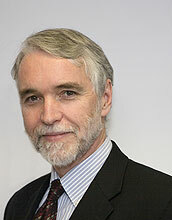 NSF has appointed Tim Killeen to be Assistant Director for Geosciences beginning July 1, 2008. Tim is currently director of the National Center for Atmospheric Research (NCAR) and president of the American Geophysical Union. The Geosciences directorate (GEO) oversees three divisions, Earth Sciences (EAR), Ocean Sciences (OCE), and Atmospheric Sciences (ATM), with a combined budget of $752 million. One important consequence of Tim's arrival at NSF is that we may now see someone appointed as director of the EAR division. After Herman Zimmerman retired, Art Goldstein served as Acting Director but his temporary appointment expired and he left for a deanship at the College of New England. Jim Whitcomb is the current Acting Director. Appointment of a permanent division head was put on hold last year when GEO Director Margaret Leinen left for a job in the private sector. NSF decided to wait until her replacement was appointed (just announced to be Tim) so he can play a lead role in selecting the person to head EAR. Hopefully, EAR will get someone in the permanent position soon and eliminate the uncertainty that has hung over the division for too long. The House Environment Committee turned down the merger (HB2584) of AZGS and ADMMR by a vote of 4-3 yesterday. Chairman Ray Barnes refused to allow the bill sponsor, Rep. Theresa Ulmer (right), to introduce an amended version of the bill changing the name of the AZGS to the Arizona Bureau of Mines and Geology. He also would not let her explain the reason for making the name change at this time. The inclusion of the word "mines" had been the number one objection to the merger from many ADMMR supporters. However, since the time Rep. Ulmer offered to make the name change, ADMMR Director Madan Singh and Board Chairman P.K. Rana Medhi have repeatedly said the name is just "cosmetic," "window dressing," or "meaningless." With that no longer an issue, Rep. Ulmer agreed with the Chairman's proposal to move forward with the original bill. At the hearing, opponents of the merger claimed that despite language that leaves the ADMMR mission completely intact, the real intent of the bill was to eliminate the agency's functions as part of an anti-mining agenda. In a surprisingly frank admission, Madan also said that he expected the Legislature would eliminate them completely if they were included in the "sunset review" (Legislative review of state agencies effectiveness and usefulness) that is regularly scheduled for AZGS in 3 years. The last Legislative proposal to eliminate ADMMR was in 2003. Previously, Legislative bodies recommended zeroing out the ADMMR budget in 1985, 1986, 1991, and 1995. Funding for the ADMMR Tucson office was eliminated in 1989. In 1999, the Legislature proposed eliminating the mineral information section of ADMMR but retaining the museum. The department survived these attempts but with reduced staff levels and capabilities. The Governor's current proposal to merge ADMMR into AZGS was intended to provide greater security and stability to that agency so they aren't constantly in threat of closing down or having their budget zeroed out. She also expected that AZGS would bring a more entrepreneurial business model to ADMMR operations. With yesterday's committee vote, the merger proposal is dead. 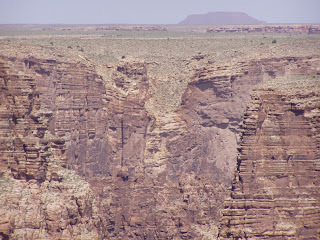 EOR reports today that their 10-2-30 well tested 3.1 million cubic feet per day of dry CO2 production from the Amos Wash and Granite Wash pay zones in the Permian Supai Fm. 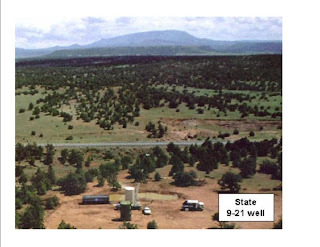 EOR plans on using the CO2 for enhanced oil recovery operations in the New Mexico-Texas region. another update: see the comment below. 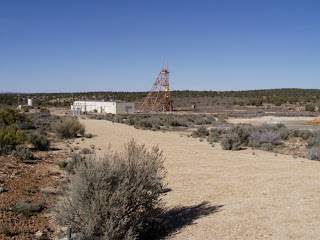 I had interpreted the Granite Wash zone as the basla unit of the Supai Fm. rather part of the underlying Pre-Cambrian basement. I apologize for the mistake. 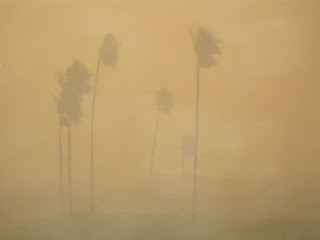 Dust increased 500% in Western U.S.
A new study in Nature Geoscience finds that dust deposition increased 500% in the last two centuries above the average levels of the last 5,000 years. The authors (including Jonathan Overpeck at UA) conclude the higher dust levels are due to expansion of livestock grazing in the early 20th century as settlers moved west across the continent. 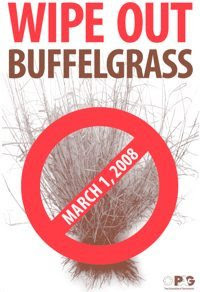 Saturday, March 1 is Buffelgrass Eradication Day in Pima County. Most of the attention being paid to this invasive species centers on its crowding out of native species and the fact it burns so hot it can destroy saguaro, something that normally doesn't happen in the Sonoran ecosystem. Also, the spread of buffelgrass will convert our desert into a savannah-like environment much more prone to repeated wildfires. And the problem with extensive wildfires is that they clear the land, and especially hillsides of the vegetation that holds the soils in place. All over the West, one the first things land managers do after a wildfire is to reseed quickly, so as to reduce the mudslides and debris flows that come with the subseq uent rains. If buffelgrass continues its expansion in the Catalina and Tucson mountains, expect to more debris flows like the ones that so damanged Sabino Canyon in 2006 and expect mudslides coming into our neighborhoods. There are also serious threats to water quality in post-fire situations. One of last week's big stories in science was the measurement of how much force it takes to move a single atom - it's one 1,600 millionth of an ounce of force to move a single cobalt atom across a copper surface, in case you were wondering. Researchers at an IBM center and and the University of Regensburg in Germany published the results in the journal Science. What didn't get as much attention is Arizona's role in this breakthrough discovery. We supplied the Arizona Ice Tea aluminum can (right - New York Times). 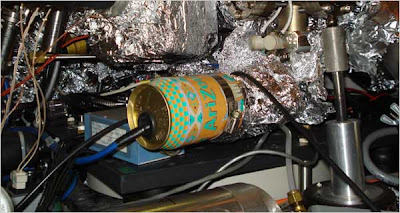 The Times reports that the physicists "needed a shield around a high-voltage component, and the can was the right size." The House Environment Committee will hold a hearing on HB2584 about merging the ADMMR with AZGS, starting at 1:30pm, Wed, Feb 27, in House Hearing Room 5 at the Capitol in Phoenix. The bill is being amended in response to stakeholder input, to rename the combined agency, Arizona Bureau of Mines and Geology. Today's Tucson Daily Star carries a strongly worded editorial calling on Congress to prevent drilling for uranium by Vane Minerals in the Kaibab National Forest in northern Arizona. Today's Tucson Weekly similarly blasts the plans. The company plans on drilling 8 breccia pipe targets in 2008. Seven are on Forest Service lands, the eighth is on State of Arizona school trust lands, according to Vane. [right: Vane Mineral's breccia pipe targets in northern Arizona. Black dots are Vane's targets, red are non-operating uranium mines, and orange are uranium resources held by others] The newspapers object to drilling in proximity to the Grand Canyon and Colorado River. 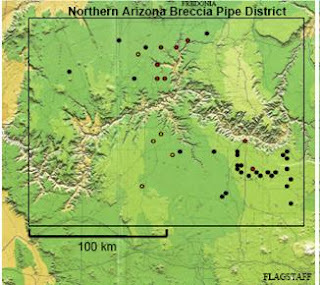 Vane reports they have 39 drill targets in the northern Arizona breccia pipe district based on a the technical report was prepared by SRK Consultants here in Tucson. According to a report in the Palm Spring Desert Sun newspaper, a group of homeowners in the Coachella Valley are suing the local water agency for overpumping groundwater, resulting in ground subsidence and fissures that are damanging their homes. 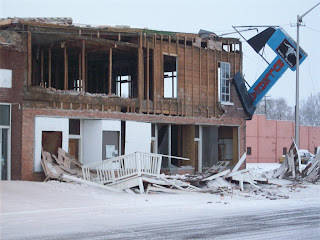 A USGS report released in December 2007 described more than a foot of subsidence in some areas during the last 9 years, and 3-4 inches in the last two years in one area. I'm hearing that this may be the first such suit over general groundwater pumping. 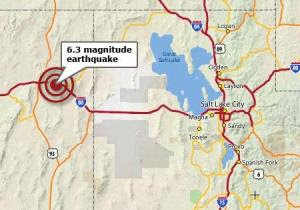 A magnitude 6.3 earthquake damaged buildings in the area around Wells, Nevada early this morning. While this is a considerable distance from Arizona, I'm posting about it because at first glance, it appears to be a typical Basin and Range style earthquake, that we can expect to occur in central and southern Arizona. There may be much we can learn from it. 5pm update: the Reno Gazette Journal posted sets of photos sent in from readers in Wells. 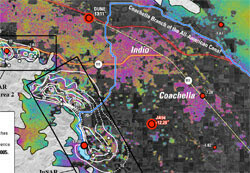 A series of aftershocks continued in the Mexicali area yesterday, with magnitude 4.7 and 5.0 events being felt in Yuma. These follow a 5.4 magnitude event on Feb. 9. There were no reports of damage in Arizona. The following survey is being circulated among a number of geoscience professional societies so you see this elsewhere, but I want to share it with those who won't see it. 2) determine the characteristics of such a program that are most desirable. 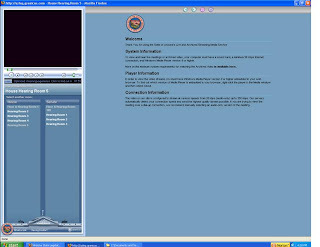 The survey will be open from 19 February through 17 March 2008. The survey is quite short, but you will be asked to consider and rate characteristics of five different models of accreditation. You can link to information about the various models from inside the survey, or you can print the information in advance at Survey Accreditation Models. Note: As the survey is being distributed by a number of societies independently of one another, you may receive more than one invitation to participate. Please disregard duplicate requests. At a time when the societal needs for geoscientists are at all-time highs, we generally remain dissatisfied with the public and political recognition and support for our science and profession. Student enrollments have not kept pace with the demands for educated geoscientists, and some departments are threatened with closure or merger. Lack of adequate instruction in K-12 and lack of an Advanced Placement Exam in geology are commonly cited as reasons why entering college students steer away from geology as a major. Conversely, lack of a consistent university program and lack of a consistent name for departments are cited as reasons that even advanced high-school geology courses are not counted as science courses for university admissions. These problems are mirrored around the world; for example, last September, a national summit in Australia addressed the “plight” of geoscience departments—decreasing in numbers, shrinking in majors, and declining in faculty positions, all despite a national shortfall in the geoscience workforce. Among the challenges are attracting and retaining students, preparing students to become effective professionals, and gaining public and political recognition and support for our science and profession. Obviously, many approaches must be taken in parallel, but is one approach to offer a national standard for accreditation of departments who choose to participate? Last year, in a GSA survey of department chairs, 49% favored the concept of some form of accreditation. Following on that survey, a consortium of societies is conducting this survey of geoscientists in academia, industry, and agencies. This survey addresses not simply the concept but the general design of a program of academic accreditation. We hope to have the widest possible set of responders to this survey, in order to gauge the opinions of the greatest diversity of geoscientists. Please let us have your response. AGI reports that there are 20,560 students enrolled nationwide in bachelor degree programs in geoscience. Arizona's 15 departments account for about 1.8% of all Geoscience Departments in the country (about 850 nation-wide), so our enrollment percentages could be considered on target. We just have fewer departments than big states like Texas with 44. There's a recent report out that I missed, showcasing the economic contributions by Arizona's astronomy, planetary, and space sciences community (APSS). With UA's Planetary Sciences dept and ASU's School of Earth and Space Exploration, this report includes strong geoscience components. shows APSS research in Arizona in 2006 returned a total dollar economic impact or $252.8 million and described what's needed to keep these programs vibrant. Last Thursday, I asked for opinions and recommendations on naming the combined AZGS-ADMMR agency. A couple folks posted comments on that blog posting, but most sent emails to me directly or copied me on email discussions within the Mining Foundation of the Southwest listserve. I compile all that I received so far, without names but where people identified it, I indicated their type of affiliation or background. As new ones come in, I'll add them to the list. (1) The pressing important issue for the stakeholders should be the preservation of the functions of ADMMR--for which the proposed legislation seems to provide-- not whether "mines" is in the name. Perhaps this has come from the "industry" itself, which has always felt "owed" this word in the name of a State agency. "Division of Mineral Resources" is a reasonable name. (2) The name of AZGS should not be changed. Combining the "ands" such as in the Bureau of Mines "and" Geology has always seemed grammatically awkward. "Geological Survey" indicates a broad-enough umbrella for all the functions. I agree, let's keep it simple. I too suggest "Arizona Bureau of Mines and Geology." The new organization then would have a "Mines and Mineral Resources Division" and a "Geological Survey Division". I favor Arizona Bureau of Mines and Geology. Thanks and best wishes. 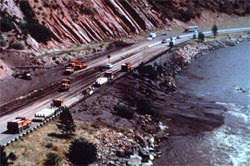 The Mining Foundation of the Southwest is prohibited by its tax status from responding to political issues as an entity. According, you should respond individually, but keep in mind that there are any number of other groups that could do so. I too would like to see [commentor #2’s] extended suggestion implemented. You have done a good job of making your intentions clear. I think it is critical to have a minerals emphasis. We are clearly in a mineral commodities long term shortfall world wide. Arizona stands to benefit greatly if we do the right things. For many decades the State has given minerals short shrift. So much so that I think it is an embarrassment. Considering mining projects in the mill will put billions of dollars into the State coffers it is "politely put" short sighted. I would be happy to work with you, or a committee to testify etc. to get a more reasonable budget for the State agency(s) to insure you are able to be more aggressive in your minerals mission. Following up and agreeing with [commenter #2 above], Arizona Bureau of Mines and Geology sounds fine. As is (the Bill), this will be just a cosmetic change and will not address real facts - the advocacy of mining in Arizona and the leadership and objectives of the department. From leadership point of view, there must be a new position of Director of the newly created State Agency - incumbent must have high civic and industry reputation and broad overall experience in mining, metallurgy and mineral economics etc. with exceptional leadership quality.He/She must also have be a PE. The House Bill suggest that the AGS director becomes the director of the combined new agency. The current AGS director do not have the above mentioned qualifications to fill the position of Director of the combined agency. He can continue as State Geologist of the Geological Survey Division, but not the director of the New Arizona Bureau of Mines and Geology. The current Director of ADMMR is much more qualified for the Director's position of the new agency then what is proposed in the House Bill. Personally I opposed the HB 2584 as it is written. I agree with __ and __'s proposals. The two divisions could then maintain their own goals and operate independently, much as they now do. This seems quite important from the comments. I am less concerned with the name and more concerned with the purpose and mission statement. What will the mission be? Are we for mining still? Or are we against it? Let's just say that up front. I would say that the governor is against mining as she has come out opposing the new mine in Superior that Resolution Copper has been trying to work out. So I am suspicious of any government dealings with merging a pro-mining entity into something other than pro-mining. The mining industry is already under represented as it is, obviously, since a pro-mining representative would not have even considered merging the ADMMR into any other entity. How much tourism is generated by mining and mineral activities in Arizona and particularly southern Arizona? That question came up repeatedly last week as geologists and mineral collectors from around the world participated in the Tucson gem and mineral shows and all the associated professional, hobby, and social activities. I heard a number of discussions about the news of a study commissioned by opponents of the Rosemont copper mine south of Tucson. That study speculated that if the mine caused a 1% drop in tourism in the region, the economy would lose $30 million, or more than gained from the copper mine. As the State Geologist, friends and colleagues in the profession peppered me with questions about public support of mining and how much tourism around here is generated by people attending the gem shows (the convention bureau estimates $100 million), amateur rock hounds, and people touring active mines, old mining camps, and ghost towns, among similar activities. At a reception the other night, some geologists, supportive of mining, asked very pointed questions as to whether the gem shows might be at risk if the Tucson area was to become viewed as openly hostile to the miners who mine the gems and minerals and the collectors who treasure them. Another noted that a copper mine is prominently in view to everyone flying in and out of the Tucson airport and if that isn't turning away tourists, why should a mine 20 miles away in the mountains knock out the equivalent of 30% of the 55,000 gem show attendees (more than 16,000 people) not coming to Arizona at all or buying anything during the two weeks of the shows. But does gem and mineral dealer or buyer really care about any of this, as long as prices are good, sales are up, and the freeway construction doesn't interfere too badly with business? Deliberately provocative questions. Are there any studies that show why the Tucson gem, mineral, and fossil shows have grown to the be the world's largest? Where was the world center before and why did it lose out to us? What do we have to do to keep it so vibrant and even grow more? above right - native gold, Calif. There are lots of reports and photos online from other observers. Take a look at The Vug for a long list of show reports including extensive video reports from many of the best displays. The Mindat report from the show has spectacular pictures of some of the best speciments on sale. Most of the 49 independent gem, mineral, and fossil shows were closing down today. What I tried to capture with these snapshots are a sense of the scope and nature of this amazing event. It's like a city-wide swap meet and yard sale, but only with rocks. There is a problem with this report because it describes growth of geoscientist positions by 22% by 2016 but shows that being 6,800 new jobs in 8 years. I can't believe there will be only 850 new geoscientist jobs per year nationwide. There's a disconnect here somewhere. What should we call the merged agency? Resolution Copper: "It's crunch time"